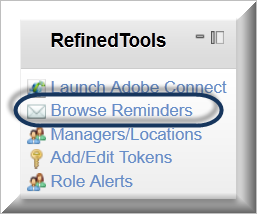 Refined Reminders is a powerful and versatile HTML email notification system that provide seamless communication between your users, the LMS and Adobe Connect. Reminders can be used to welcome users once they are registered into a course, to remind users of for upcoming meetings/webinars with access links and instructions, as a follow up communication after an event or to to send customized messages. 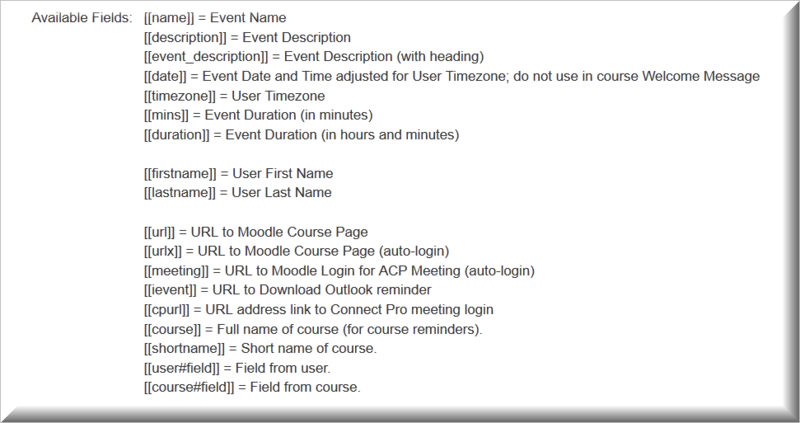 Your LMS comes with a few default reminders that you can use to provide links to meetings or courses. However, you can create custom reminders with branding, tables, images, links and colorful text, even other languages. Reminders are sent in the language of the recipient or the default of the system if that language reminder has not been created. You may edit any of the default reminders, use them as a template or create new ones. In the Body of the reminder, you can use the editor to create branded and distinct messages. 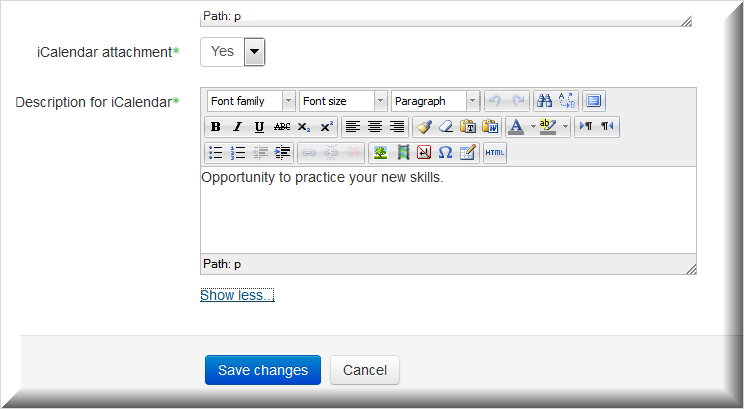 Or you can click on the HTML icon on the tool bar to modify the message code directly. These dynamic fields can be entered as tags (shown in double brackets) in the Subject line or Body of the Reminder and are then translated into their actual value at the time the email reminder is sent. For instance, if you use the tag [[firstname]], the user’s first name will be displayed within the reminder. For users across time zones, the reminders go out at the set amount of time prior to or after the event; however, if the tag [[date]] is used, it will be displayed in that user’s time in their time zone. The [[timezone]] tag indicates the user’s time zone in addition to the correct time for their time zone. Do not use date tags in Course Welcome messages set on the course settings page. It will not pull the date of the event but the date that the course was created or is available to students. Also note that the description tag in a Course Welcome message will pull the course summary, not the event summary. Some of the tags take the recipient to the LMS course page or directly into the Connect meeting room. These contain encrypted user information so that no login is required. User fields draw information from the authenticated user’s profile. 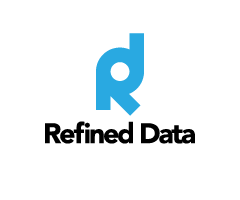 See the Refined Personalization Tags article for more information on which fields work with reminders. Course fields draw information from customized course fields. They can be used in reminders to include any information in a course that users might need to know ahead of time. For more information about creating and using course fields and the related course tags, see the Refined Course Tags and Custom Course Fields articles. If you are creating a Course Invitation message or a Role Verification message, you will use specialized tags. See the Role Alerts and the Course Invitation sections of the Sending Customized Reminder Messages page for more information about these Refined Messages. There are two ways to create a new reminder: use an existing reminder as a template or create a completely new reminder. Make any required revisions to the reminder, incorporate any of the Dynamic field variables mentioned in the previous section and click on Save changes. This is a quick and efficient way to create a new reminder, especially if you are using tables or corporate branding. Enter a unique and memorable Message ID; this is what will appear from the drop down menus in the LMS when selecting which reminder to send. Next, enter how the Subject is to be displayed to the recipient, whom the email will be from (From Name), select Language (English is the default) and then add text for the Body of the message. HTML may be used to add branding, tables, images, links and colorful text. 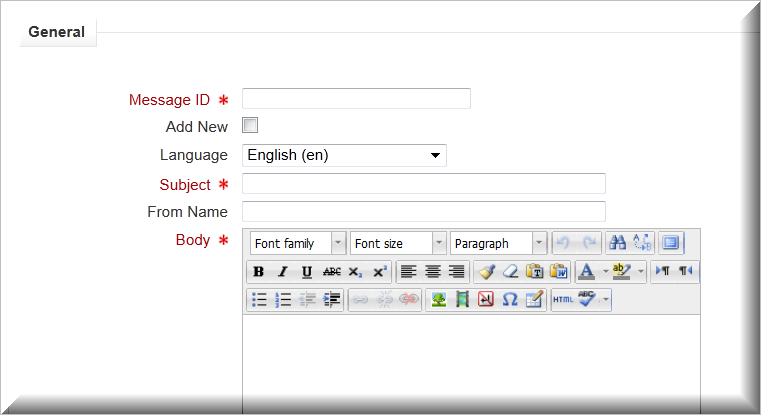 Selecting a language indicates which language the reminder is written in and that language must be enabled and available in the drop down menus on the site to appear here. Important to note that the Message ID needs to be the same for translated messages as only the system default language Message IDs will be available for selection. Click on Save changes to create the new reminder. Run Email Test to Self from the Send column of the Browse Reminders page to ensure that the new reminder looks as you expect it to look. Make sure that reminders for each language available to the users are created from templates of the master language using the same message ID. When entering tags in the text via the WYSIWYG screen, it is best to type them out as opposed to copying and pasting. At times when using the copy and paste feature, code that is not visible is copied and could cause an error in the reminder. The From name field uses the format can indicate who the message is from but will always pull the support email address of the site. Clicking on this expands the iCalendar option, which allows you to include a description of the meeting in the reminder. 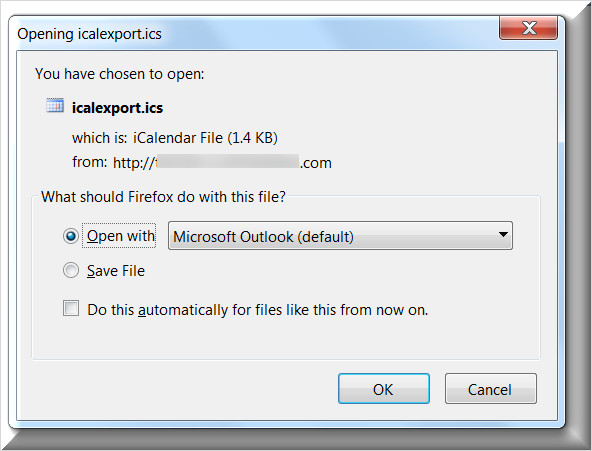 When the user selects OK, they see the same option to add a reminder for the meeting to their Outlook calendars as with the attachment. For information on using Reminders, see Sending Customized Reminder Messages.